Way back, when your student was deciding on where to go to college, attending Seminole sports probably came into play. It’s just what we do. And it’s fun…even if you don’t know what’s really happening on the court/field. (Who me?) The important part is to know when to cheer, when to chop (Seminole chop is taught at orientation and if you missed that class, it’s pretty easy to catch on, but I will describe later) and when it’s a good time to run out and get a drink (I mean water. It gets extremely hot on some game days.) The key is learning where in the stadium to sit based on time of game and shade. 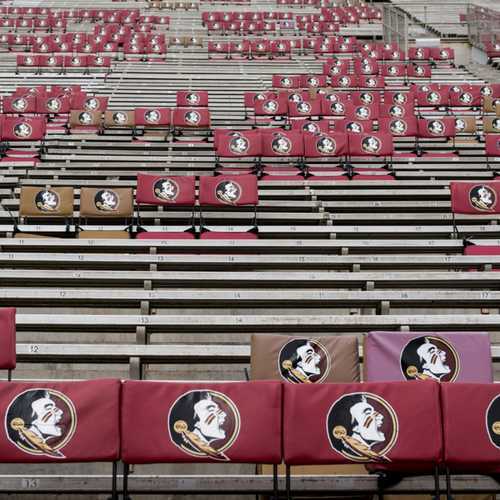 Did U know…FSU students get in FREE to all Seminole athletic events, including football? Football, basketball, and baseball are the most popular, but tickets are available to view golf, lacrosse, soccer, swimming & diving, tennis, and track & field too. Getting tickets works on a points system. Students accrue points based on their class standing (so seniors have priority over freshman). There is a way around that, though. Have your student join the Seminole Student Boosters, which will give them 500 Spear-It points and faster access to sporting events. As a matter of fact, you too can join the Boosters and reap the rewards of membership which include ticket and parking priority; oh and they only serve beer in the Boosters section of Doak Stadium (and nowhere else). FSU competes as a member of the National Collegiate Athletic Association (NCAA) Division I level primarily competing in the Atlantic Coast Conference (ACC) for all sports and have 20 participating sports teams. The Seminoles’ athletic department fields 20 teams. They have collectively won 17 team national championships, and over 100 team conference championships, as well as numerous individual national and conference titles. The Seminoles football team, who achieved three undefeated titles, has won three national titles, eighteen conference titles, and six division titles. Many people know of Jimbo Fisher, their head coach, and a fearless leader. The Seminoles play at Bobby Bowden Field at Doak Campbell Stadium. The official seating capacity is 79,560, although the record attendance has been closer to 85.000. With a large and loyal alumni base and strong student support, the excitement of game days builds rapidly depending on the start time. There are RV areas with alumni starting to tailgate hours before each game, fraternity houses hosting parties and many bars running specials. The most outstanding tradition in college football then occurs when a student portraying the famous Seminole Indian leader, Osceola, charges down the field riding Renegade, an Appaloosa horse, and plants a flaming spear at midfield to begin every game. The Marching Chiefs play the “war chant,” which you will learn in no time. Probably most important, is to practice a repetitious bend at the elbow, symbolizing a tomahawk swinging down, and you will have perfected your “chop,” a pertinent part of the day’s festivities. Non-students may not use student tickets as entry does require showing your student ID. You can purchase tickets on the official website providing the game is not sold out. You may also want to consider joining the Boosters if you intend to go to a fair amount of games throughout the season. It can make getting tickets easier. A secondary source is through StubHub. Depending on the game, tickets can get pretty costly. Try to map out which games are of interest to you now; the earlier you purchase tickets, the easier it can be. Beware: There are many scalpers roaming around the stadium prior to the game, but oftentimes they are asking not only for a large markup on the face value of the ticket but you never know if it is a legitimate ticket. If you choose to take that chance, it is recommended you know the full layout of the stadium beforehand. A few more things… Doak is a tobacco-free stadium. I highly recommend either investing in a seating cushion or visiting one of the booths just inside the stadium to rent a chair back from $5 up. I told you above about Doak’s new alcohol policy, but Howser Stadium serves beer now too. There are many concessions that sell water, soda and ice tea and lemonade for all other seating. On extremely hot days, they will sometimes allow fans to bring in one empty water bottle and use the bottle refill fountains throughout the stadium. Of course, I wish I knew this before I spent close to $50 keeping my family hydrated during a noon game. A noon game can get dangerously hot if you are not in the shade. Often, you won’t know the time of the game until a few weeks (sometimes days) before, be thinking ahead. Demand for hotels is extremely high (and can get expensive) during football weekends, especially the strong rivalry games and homecoming. Try to book as far in advance as possible. Many hotels require you to cancel 30 days out during these weekends (normally you can cancel 24 hours in advance). Finally, you may not carry anything except a tiny purse, wallet or clear bag into the stadium. Many of our students graduate and are now lifelong Nole fans, but can’t get back to Tally for the games. Good news: There are many bars dedicated to alumni throughout the country; and not just in Florida. There are 3 in NYC alone.